Floral cropped pants are a big trend this spring and I’m loving it. 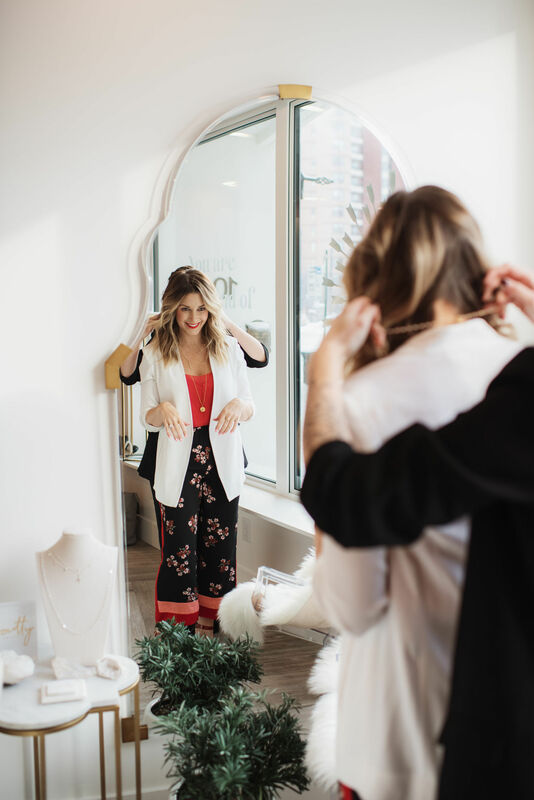 Shop my outfit, including my favourite jewelry below! I landed on these floral cropped pants when styling my outfit for my So Pretty Cara Cotter Valentine’s Day photo shoot. I wanted to steer away from super feminine but still keep things pretty and edgy for this particular look. This outfit would be perfect for your Galentine’s Day get together or Valentine’s Day date night! A fitted turtleneck would also look stellar under the blazer. Snag yourself a pair of these floral cropped pants (before they’re gone!) from one of my favourite boutiques in Edmonton, Bamboo Ballroom. You can shop them online or in person at their shops in Edmonton or Calgary. Be sure to use the discount code Kari20 for 20% your entire order! Details on the rest of the outfit are below. Whatever your plans are to celebrate L-O-V-E, I hope you have a fabulous time!